Are there cats on your holiday gift list? How about cat loving people? At CatHealth.com, we have plenty of both on our list. We did our shopping, and we are making our gift list available for you here, so you'll have all the best cat products in one spot. Make quick work of your holiday shopping this year! 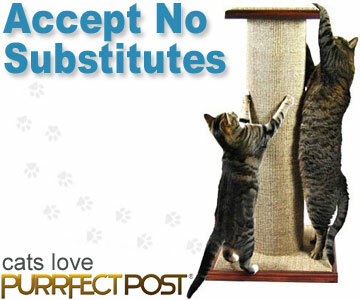 When it comes to cat scratching posts, Purrfect Post® truly is the perfect choice. Purrfect Post® makes cat scratching furniture in all different shapes and sizes, offering something for every cat out there. Our favorite pick this year is the Purrfect View cat tree. The base, posts, platform, and bed on the View are all covered in high-quality sisal fabric—the best scratching material for cats. With two wood stain color options, two sisal color options, and three platform/bed color options, you can completely customize your cat tree. If you really want to impress your kitty, opt for the Everest Edition, which sports an even taller topmost bed and more space between the two platforms, for extra scratching real estate. We love these cat trees, and we know your cat will, too! We are really excited about this new product that is sure to make kitties happy everywhere they love to nap. Which is, well, everywhere. These round blankets are made of the softest faux fur fabric you can imagine, and they come in lovely colors. There are two sizes available, 15" in diameter and 22" in diameter (small and large). You can throw a Muffin Blanket™ inside another cat bed or anywhere your cat likes to nap, to keep the surface free from cat hair. They're well-made by hand in the USA, and they're definitely cat-approved. Fancy hasn't left hers since we put it down for her. Does your cat jump on the counter when you brush your teeth, trying to get a drink from the faucet? Lots of cats prefer drinking running water to still water from a bowl, and a Pet Fountain is a great choice. It filters and aerates your cat's water continuously, cutting down on bacterial growth. Its carbon filter removes objectionable odors and tastes that may be keeping your cat from drinking as much as she should. The Pagoda and Seascape are just plain beautiful, and the Pagoda comes in four colors. They're made of ceramic, not plastic, and will blend beautifully into any décor. They have lovely, soothing falling water sounds that are de-stressing to the humans in the household, too, so get one for yourself as well as everyone on your list. It's no secret that cats love to sleep. It's also clear that they like to do so in the coziest spots possible. Tiger Dreamz makes super soft cat beds in a variety of shapes, sizes, and colors. Regular, flat beds come in small, large, and extra-large, so any cat or space can be covered in coziness. There's also a Trundle Bed available, which is really three beds in one because it can be made into a flat bed, a doughnut or cup shape, or a sleeping bag, so your cat can really dig in and get comfortable even on chilly days. And, our favorite, the Tiger Dreamz Beddy Ball, is like a giant cushy marshmallow of soft beauty for a cat to sink into and relax. Cats and their owners love having new holiday toys to play with. We found a variety that are cute, festive, and many are full of extra-strong, organic catnip. There are candy canes, dreidels, trees, jingle balls, and adorable holiday mice. Even though your cat may stay inside all the time, you can bet that he still has a hunter's instincts. Satisfy them with great interactive cat toys. Wand toys that move like birds allow your cat to stalk, sneak, and pounce on "prey" just like his intuition tells him to. Toys that move like mice or that have components that move unexpectedly like the Frolicat Cheese Cat Toy are great for making cats feel like big, bad hunters, too. If you have one of the rare cats that doesn't care much about catnip, have no fear. We've found some gifts that will be perfect for your kitty. There are honeysuckle-stuffed mice, socks, playmats, and even some honeysuckle spray to use on old toys. You can find all of them here: Honeysuckle Products. Cats love to scratch when they first wake up, after they eat, and even occasionally under their human's bed. The Purrfect Angle is the best way to accommodate all of these feline scratching needs in one attractive item. Sturdy, appealing, and versatile, the Purrfect Angle can be placed flat or at an angle for your cat to enjoy. And its heavy-duty corrugated cardboard is a great scratching surface that your cat will love. You can even get extra replacement inserts and just toss them under the bed or in the closet for your cat to discover. Many cats love to curl up in small spaces. They like to observe the world from a hidden spot, possibly jumping out and pouncing as someone goes by. They also love to curl up in a small spot that holds their body heat, so they can be nice and warm while they're sleeping. Cat Caves are beautiful, individually handmade with wool in Nepal, and cats absolutely love them. The ultimate in kitty comfort! These pillowcases zip right over a standard size pillow, creating an easy-to-clean bed for your cat that means she won't have to steal your pillow anymore. The reason your cat likes to sleep on your pillow is it smells like you and provides comfort. Covering an old pillow you don't use anymore with a Muffin Pillowcase means your cat gets to sleep on a bed that smells like you while leaving your current pillow open for your own weary head. Win-win! Plus, the Muffin material is ultra-soft and gorgeous. Our final cat gift recommendation this year is one that you and your feline friend can enjoy together. Studies have shown that cats relax when classical music is playing. The Music My Pet Holiday CD has all of your favorite holiday songs in beautiful instrumentals, so you and your cat can both enjoy the season with less stress and more cuddle time.